Summary and Definition: The Wahkiakum Native American tribe were part of the Chinook nation and were amongst the Native Indians encountered by the Lewis and Clark expedition in 1805/6. The Wahkiakum tribe were among the Native American Indians who changed the shape of their heads to a flat, elongated shape and nicknamed 'Flatheads' by the white Europeans. The Wahkiakum were traders and fishers who lived along the Columbia River. The Wahkiakum tribe were a Native American Indian people, members of the Chinook nation, who controlled areas on the north side of the Columbia river in modern day Washington. Their tribal name comes from a Chinookan word meaning "tall timber". The Wahkiakum people were organized into villages and settlements that consisted of plankhouses made from the "tall timber" cedar trees. The Wahkiakum tribe were among the many Northwest Native American Indians who decorated their skins with tattoos and artificially re-shaped their heads according to the traditions of their people. This dramatic change in their appearance and their elongated, flat heads led to the nickname of 'Flatheads'. Refer to the Flathead article to learn more about their lifestyle and method of creating the elongated and flat shape of their heads. As can be seen by the following map the people of the Wahkiakum tribe lived in close proximity to many other Native Indian tribes. 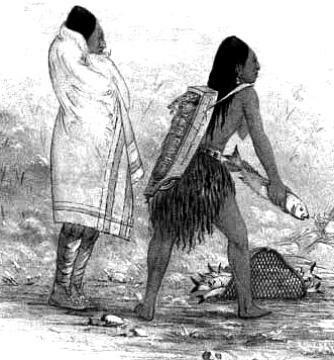 There lifestyle was similar with their neighbors in relation to their clothing, their religion, the food they ate, their plankhouses and their canoes. For details of their way of life refer to the Chinook Tribe. In 1810 members of the Kathlamet tribe moved across the Columbia River and joined the Wahkiakum in a village at the present site of Cathlamet. Where did the Wahkiakum tribe live? The Wahkiakum are people of the Northwest Coast Native American cultural group, often referred to as Flatheads. The location of their original homelands were on the north of the Columbia River in what is now the State of Washington. The geography of the region in which they lived dictated the lifestyle and culture of the tribe. The location of their villages were along the north side of the Columbia River. The Lewis and Clark expedition made contact with the Wahkiakum tribe in 1805/6. The following article, Journals of Lewis and Clark: Native Indians, provides details of their encounters with the Native American Indians who inhabited the region. Lewis and Clark reported that the Corps of Discovery met the Wahkiakum on several occasions when gifts were exchanged, and the ideal of trade with the United States was discussed. The tribe were referred to as the "Wackiakums" in the famous Lewis and Clark journals. Wahkiakum History: What happened to the Wahkiakum tribe? A terrible epidemic, known as 'Gray Fever' (thought to be Asian Flu or smallpox) wiped out much of the Wahkiakum population during 1829-30, leaving about 500 people. The population increased with time and many of the survivors had moved to the Yakima Indian Reservation in Washington State.